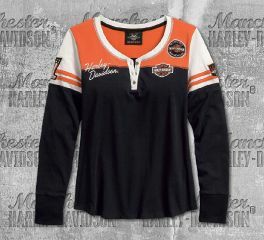 Women's Harley-Davidson® Heritage Collection of motor clothes and accessories. 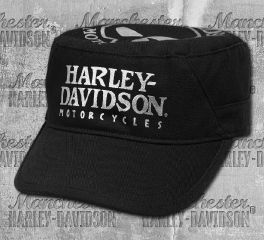 Have this as an addition in your Harley-Davidson® hat collection. This Embroidered Logo Jersey Cap features an embroidered logo on front which will reflect how proud are you to have this one of a kind cap once you wear it. 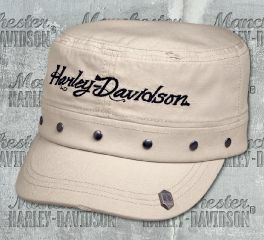 A perfect addition in your Harley-Davidson® hat collection. This Women's Eagle Appliqué Flat Top Cap features an appliqué graphics that is located on front. Asphalt grey finished top cap that can be worn to perfection. Harley-Davidson® Women's Winged Logo Headwrap has a comfy elastic band that fits on different sizes. 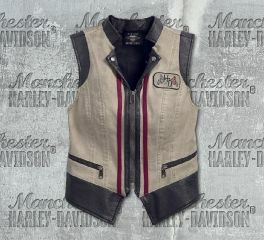 It features an embroidered winged logo, and Harley-Davidson® lettering graphics. 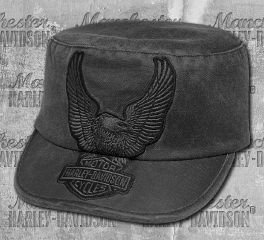 Harley-Davidson® Women's Black Winged Logo Flat Top Cap features an embroidered winged logo on left side with an embellishment of studs. Adjustable strap with clasp featuring the B&S® logo on the back. Harley-Davidson® Women's Black Foil Skull Flat Top Cap features a printed graphics on front, and printed Skull graphics on top. Rear adjustment strap has the B&S® logo on the clasp. 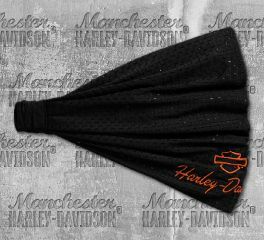 Harley-Davidson® Women's Black Embroidered Mesh Headwrap has a comfy elastic band that fits on different sizes. It features a contrasting color of Harley-Davidson® Bar&Shield® embroidery. Wind-whipped, helmet hair, stray strands…whatever you do endures on the open road, our Black Embellished Skull Headwrap has you covered. More fitting than a traditional biker bandana, thanks to the comfy elastic band. This accessory has printed skull graphics and perfectly aligned rhinestones to shine on. 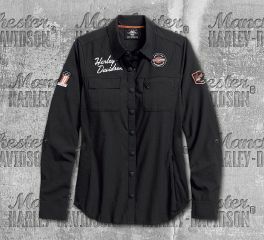 Harley-Davidson® Women's Performance Fast Dry Vented Classic Shirt is a long sleeve shirt with snap tab and can be rolled up depending on your choice. It has two chest pockets, button front, button cuffs, graphics on both chests, and sleeves. The classic Bar&Shield® logo is located on the back. Harley-Davidson® Women's Black Classic Colourblock Henley Long Sleeve Tee has graphics printed on both chests, as well as on both sleeves. 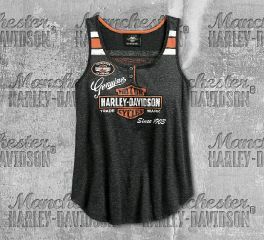 The back features a classic Harley-Davidson® B&S® logo as the backprint. Harley-Davidson® Women's Black Skull Short Sleeve Shirt has a snap-down collar, zipper front, Skull graphic on left chest and on the right sleeve. The back features a cross-string design and a printed graphic. Harley-Davidson® Women's Genuine Oil Can Plaid Short Sleeve Shirt has two button chest pockets, button front, embellished graphic on upper left chest, and graphics on the lower right waist. This Short Sleeve Shirt also features an embellished graphic on back. 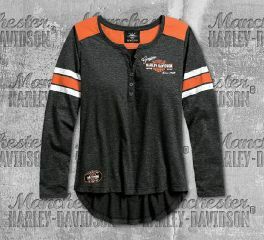 Harley-Davidson® Women's Genuine Oil Can Henley Long Sleeve Tee features a Genuine HDMC™ Since 1903 graphic printed on left chest, embellished with studs. The genuine oil can logo printed on the back is embellished with studs. Harley-Davidson® Women's Black Genuine Oil Can Tank features HDMC™ Since 1903 graphics printed on front and embellished with studs.